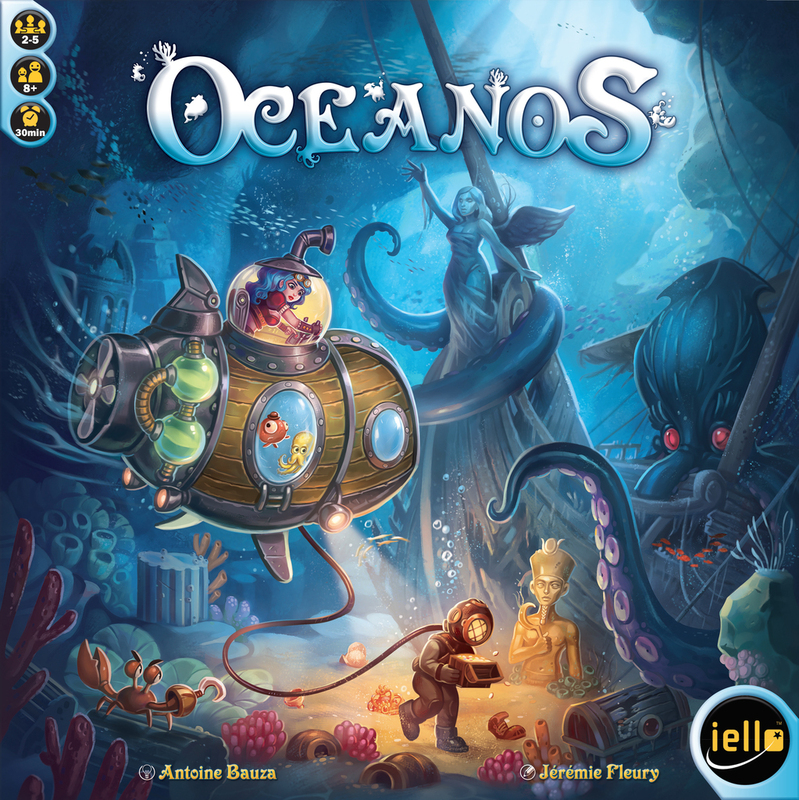 Oceanos is a fast-paced gateway card drafting game that is played over 3 rounds. To begin the game everybody boards a submarine equipped for an expedition to the ocean floor. Players draft exploration cards and place them in front of them from left to right in 3 stacked rows (a row for each round). Every card represents an explored section of the salty waters and marks your discoveries. The cards show a mix of sea creatures, corals, treasures and Kraken eyes for scoring and crystals and basecamps needed for upgrading. Upgrades on the 5 separate modules of a submarine will boost a player’s abilities and scoring options. All submarine segments: cockpit, airlock, aquarium, motor and propeller, start at level 1 and can be upgraded to level 2 and 3. For each round there is a separate exploration deck: players dive from the surface (round 1) through the deep sea (round 2) until the bottom of the ocean (round 3). Every turn the start player – named “Expedition Captain” – deals a minimum of 2 cards to all other players. The players pick a card and add it to their ocean display. The discarded cards are returned to the dealer, who can then make a carefully considered choice. Next the starting player gets passed in clockwise order. One crystal allows leveling up a module from 1 to 2. A combo of a green and a yellow crystal allows leveling up from 2-3. An upgraded cockpit makes a player get dealt more cards. Fuel tokens, stored in the sub’s motor, can be used to play multiple cards in one turn. A game of Oceanos is short. After 15 turns the game is finished; making it impossible to upgrade fully and maximize scoring on all elements. Captured animals and propeller level are scored every round . The submarine’s aquarium level determines how many encountered unique species a player can transport. An upgraded propeller gives a fixed number of points. Treasure chests and corals only get scored at the end and for the 3 rows together. All corals in a player’s largest contiguous reef earn him one point. The value of treasures is determined by drawing chips from a bag, but the treasures only get salvaged if a player sent out a scuba diver upon playing the card. At the game’s end all divers swim straight up to the surface and pick up all treasures along their way. Therefore three stacked treasure cards with the diver assigned at the bottom of the ocean is the optimal situation, but a huge bet. A bigger airlock can hold more divers, making the treasure hunt less lucrative. While players try to devise a synergy between their submarine upgrades and drafted cards, the merciless Kraken keeps a sharp eye on the explorers. The Kraken is possessive about the ocean’s richness, and will cast a curse on whoever caught his eye the most that round. The player(s) with the most Kraken eyes in the round’s row get a randomized point penalty. Oceanos is designed by Antoine Bauza, who earned the title “Card drafting King” for creating 7 Wonders and 7 Wonders Duel. This time he opted for a gateway family game, but he added enough depth for genuine board gamers to enjoy it too. Artist Jérémy Fleury / Trèfle Rouge immerses players in a wondrous underwater world, waiting to be discovered. Instead of passing on cards in a clockwise manner, everybody gets dealt a fresh hand each turn. A round in a regular card drafting game can feel like fishing in the same, ever depleting pool, but Oceanos allows for new opportunities each turn. This luck of the draw fits the theme, as the deep blue sea is a vast mysterious place. The passed on role of Expedition Captain creates interaction between all players: the captain gets the advantage of knowing what elements other players are collecting, but needs to pick from the bones instead of getting the meat. Tension is added by the push-your-luck factor when assigning scuba diver(s) and the menacing feel of the luring Kraken that punishes the most greedy player at the end of every round. Oceanos is a true gateway card drafting game. With only 4 elements for scoring and the Kraken to keep in mind, it’s a game that newbies upon the first play can fully grasp. There’s no complex card combo system, nor need to know the content of the several decks. The complexity of the game lies in weighing of short profit against long term benefit for the mere 15 turns given.